We recently worked with rising YouTube guitarist Agufish (real name Hunter Engel) for a promotion with Elixir Strings and their specially coated acoustic guitar strings. Hunter produced some killer behind-the-scenes videos as he tested out the strings’ durability over the course of a few weeks, and we decided to sit down with him for a more extended chat about his background, his YouTube career and how to succeed at content creation in an influencer-dominated social landscape. When did you start playing guitar? What’s your background in music? When I was 12, my music teacher told me that music was definitely not my thing, and I should probably focus on subjects like math. A year later, I picked up guitar and a year after that, I was in my first band! What music first inspired you to pick up the instrument? Metallica. The first time I heard Master of Puppets I knew I had to pick up the guitar. I feel like that’s a pretty common story for metal fans. Metallica tabs on Ultimate Guitar. Later I moved on to Lamb of God tabs… on Ultimate Guitar. Ultimate Guitar was my life. I would just hear riffs I liked, look up the tabs, and learn them! What are your favorite types of guitars? And favorite features/specs that you look for in your own instruments? I am an absolutely unapologetic diehard fanatic of single cut guitars. There’s something about the hefty chunk of Les Paul, and “inspired-by” Les Paul guitars, that speaks to me. Right now, I’m really into Fishman Fluence pickups; the technology behind them and the tonal possibilities that opens up are just incredible. That being said, I’m also just a fan of good guitars, and there are some things that just can’t be explained on a spec sheet. If the guitar inspires me to write good riffs, I like it! It actually started off as a challenge to myself to write and upload a song a week, which I would then upload to YouTube to share with friends. The problem is, I have maybe three friends who were only sort of into metal. So, I started switching the titles to “gear demos,” immediately picked up about 100 views a day later (which is an incredible number compared to three) and I’ve been hooked ever since. Where do you get all the guitars you demo on your channel? Sam Ash has been a crucial partner in getting the channel to where it is today. They’ve been great in helping me showcase the guitars that viewers really want to see. Nowadays I also work with brands I’m a fan of directly, which is really, really cool! What tactics have you taken to grow your channel since its inception? I focus on two main aspects, community and content. The beauty of the YouTube platform is that I’m not creating a one-way show, so I spend at least an hour a day interacting with guitar-loving viewers from all over the world through the comments or other social media platforms. Then I also try to incorporate elements from other non-guitar niches that I enjoy and have been successful on YouTube. For example, the format I use is very similar to what you’d see from a tech review channel rather than a guitar review channel. Building a sense of community and keeping the content fresh has really helped it grow. Any tips for other content creators who might just be starting out? It took me a long time to figure out when a video was “good enough” to go live. A lot of new creators (and this was me for a while) stress out about making sure everything is perfect before releasing it, which used to burn me out really quickly. Ironically, it’s actually the mistakes and imperfections that make you more personable and relatable on camera. What are your future career plans, as far as music and video production is concerned? I have absolutely no idea, and that’s part of what’s so exciting, and terrifying, about doing the whole “social media influencer” thing. Doing YouTube has opened up so many possibilities in the industry, and opportunities to work with my favorite brands… maybe one day I’ll have my own guitar line! We just wrapped up some work together on a project for Elixir Strings. How did you end up liking their coated acoustic strings? You know what, I loved them! And I’m not just saying that because they gave me free stuff. They sound and feel just like acoustic strings, but they last so much longer. I’m mainly an electric player, and these strings have me picking up my acoustics way more often. Any other info or advice you’d like to share? A lot of people ask me if it’s too late to start creating content, and the answer is no. 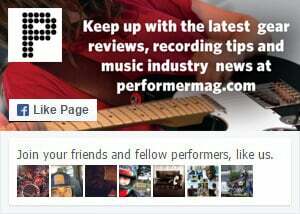 There are a lot of success stories, but no real blueprint for building a presence as a musician on social media yet. Start, experiment, find what works for you, and above all, just do it.